Sometimes the seeds of a great career in engineering lie in a project studying seeds themselves — or the technology that helps farmers plant them. 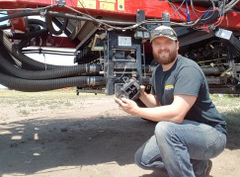 For Joel Gervais, it all started during his Master’s program at the University of Saskatchewan’s Department of Agricultural and Bioresource Engineering, when a Mitacs Accelerate internship gave him the opportunity to work with CNH Industries on a project evaluating the efficiency — and ultimately the viability — of new, larger seeding equipment to be pulled by tractors. And Joel’s research continued to prove valuable after his internship was over. During his graduate studies, his ongoing work on improving seeding technology resulted in two more patents for CNH, and a job offer for Joel. “I didn’t know the value of IP until I was on the job here and into my grad studies,” says Joel. “It’s so important to these industries — we’re all gunning for the next best thing, and people can make developments in a couple of weeks, so there’s a drive to be the first in new innovations, and to be the best.